Nine different employers, large and small have approached WoolworthsReunited, keen to help ex-Woolworths people. This page shows them all, side-by-side so that you can compare them and find how to apply. Why not take a look? Many people are traumatized when they discover they will be made redundant. The choices redundancy offers may at first be unwelcome, however, in the long term, it may provide a beneficial stimulus to change. In retrospect many people look back at redundancy as the time they were forced to really examine what makes them happy in life and many such people have realized that a career in the Care Sector can offer some of the emotional rewards that are lacking in other professions. St Luke’s Hospital Group is one of the UK’s leading providers of specialist Mental Health Services. Our units are based in North East Essex, South Essex, London, Norfolk, Hampshire and Wales. We care for people with mental health issues and those with learning disabilities and challenging behaviours. Care is provided in low secure set-ups offering physical environments of the highest quality, with many of our units sited on extensive grounds and within tastefully furnished buildings. Our success in providing safe and nurturing environments means that our services are in high demand and consequently our existing units in Essex do not have sufficient places for the number of people that require them. St Luke’s is now focused on expanding our existing services with a significant number of residential homes planned in the near future for children and adults who require care and support whilst going through difficult periods in their lives. Our expansion plan means that (in contrast to many employers at this time) we are actively seeking to recruit staff in the Essex area- both direct care staff (care workers, nurses) and ancillary support staff (eg chefs, domestics). We recognise that the one factor more than any other that underpins our success is the high quality and commitment of all our staff and we do endeavour to reward this commitment with support and good career prospects. For example current managers within the organization had no prior care experience but received training from our in-house City and Guilds registered college and received promotions having garnered the appropriate qualifications. for full time or part time care work across England. With over 100 locations nationwide, Allied Healthcare provides clients with outstanding healthcare staff, 24-hours a day, seven days a week, covering around 90% of the UK. A growing business with more and more opportunities for work arising all the time, means we need to recruit even more Care Workers, Support Workers and Healthcare Assistants. We can offer you the flexibility to choose when, where and how often you work - from full-time work to just one hour a week. Our rates are attractive and you’ll be paid weekly, straight into your bank. Even if you don’t have any experience in care, we’ll give you all the training you’ll need to make a great career for yourself. You can even study to NVQ level. It’s an opportunity to make a real difference to people who need that little extra help in their day-to-day lives. In return, we’ll offer great benefits including up to 24 days' holiday a year, a fantastic pension scheme and ongoing development. Real Life Options (RLO) is a voluntary sector (not for profit) organization, employing over 1200 people in England and Scotland. A specialist provider, supporting people with learning disabilities to live independently in their own homes; we are currently recruiting staff in Nottingham, Coventry, Leeds, Redcar and Cleveland, South Shields, Newcastle on Tyne, Aberdeenshire and East Dunbartonshire. Would you like to make a difference to someone’s life – someone who would appreciate your time, support and friendship? Working for RLO is definitely not dull or repetitive, and may bring a new perspective to your life, doing something that gives you job satisfaction and a new start. We are keen to recruit people to work with people in their own homes and in social settings. Whether you are 18 or 60, starting your working life or with years of retail experience, you could have something special to offer us. Experience is often not necessary – RLO is Investors In People accredited and has a systematic and structured approach to training for all staff. The hours are very flexible and meals or refreshments are often included. You will be working with people who are caring and committed and who enjoy their work. And the prospects are bright – many of our operational managers began their RLO careers as Support Workers. More information about RLO, including job vacancies, is available on our website at www.reallifeoptions.org and application forms can be obtained from gareth.johnson@reallifeoptions.org telephone 01977 781800 (24 hour recruitment line 01977 781808). Barchester Healthcare is the number one provider of quality residential and nursing home care in the UK. We lead the way in the provision of first-class care homes with unrivalled facilities and services. We offer careers in every aspect of our service. Start your career with us and the sky’s the limit. How high do you want to climb? We offer you a career rather than just a job through our exciting apprenticeship programmes. Our apprenticeships are open to everybody whatever age or previous experience. 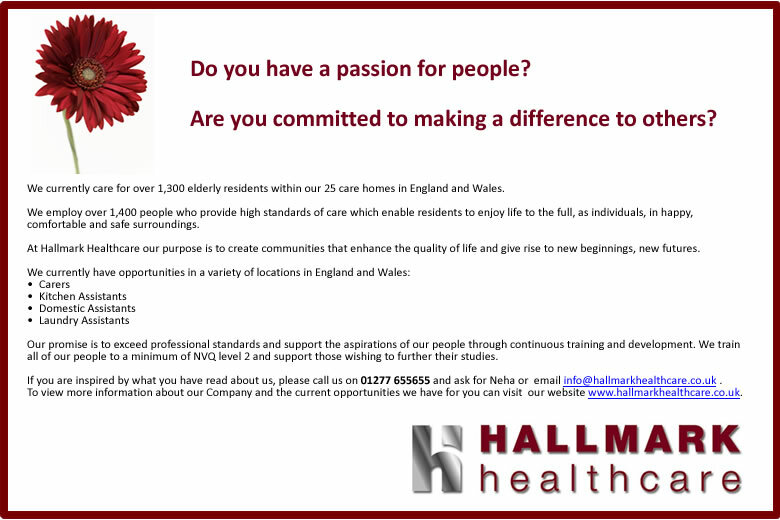 Have you considered a career in Home Care? Home Care Workers offer emotional support and practical support to Service Users in the local community, making a real difference for people from all walks of life and with a variety of needs. Our aim is to help our Service Users to be able to stay in their own homes with dignity and independence. You would work with vulnerable adults in their own homes. These could be older people, people with learning disabilities, people with mental health problems or with physical disabilities. Springfield Home Care Services Ltd deliver care across Yorkshire and Hull. If you are passionate about making a positive and real difference to the lives of the people we support then you have passed the first hurdle in joining our committed and successful team. Whether you are applying for a post as a support worker, service manager, in administration or in accounts, you should believe in continuing to improve what we do, placing service excellence above all other considerations and be passionate about improving lives. If you share our values and believe you have the right attitude we would like to hear from you. We will provide you with comprehensive training to ensure you are equipped with the skills and knowledge to join our committed team to assist in supporting people with learning difficulties to live the life they want. As one of the UK’s leading providers of services for people with learning disabilities with over 1200 employees, we offer a diverse and exciting range of job opportunities throughout the country for different levels of support and office based work. Looking for a change of direction or a new career in care? 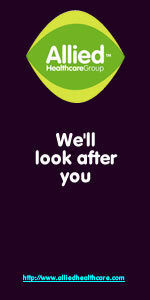 Woolworths staff with skills in customer service and working with people can build on these skills with us and are welcome to apply for jobs on our website. Alzheimer Scotland is Scotland’s leading dementia charity, providing specialist care and support for people with dementia and their carers since 1994. Our services are consistently evaluated by service users and carers as of good quality. People with dementia, their carers and families are at the centre of all our care planning and specialised, flexible support is a goal shared by all who work for Alzheimer Scotland. We employ 785 contract and sessional staff in our 60 services across Scotland and our National Office in Edinburgh. We are currently looking for support workers across Scotland. You will provide social care, personal care and support to people with dementia in their own homes or in the wider community. A robust training package is in place to assist you and ensure you provide the highest possible level of care and support. Other benefits include healthcare, credit union membership, child care vouchers. To find out more, or apply for one of these vacancies, please visit our website. The Richmond Fellowship Scotland provides a wide range of high quality support services throughout Scotland enabling individuals with mental health problems and or learning disabilities to live as independently as possible within their own homes and communities. We have seen growth in the past few years and employ over 2000 staff. We are a growing organisation and are absolutely committed to providing the best possible support and we are interested to hear from individuals who are considering a career within the social care sector. In the UK Woolworths and Ladybird are brands of Shop Direct Group. All trademarks are acknowledged. WoolworthsReunited.com is © Copyright 2012, 3D and 6D Pictures Ltd., and is published by WWW Group Ltd.